The lines at the Jewish Family Service Polack Food Bank on Capitol Hill just keep getting longer. We are serving more people than ever before, but unfortunately we are not unique in Seattle. New luxury apartment buildings and trendy restaurants seem to be springing up all around, and by many accounts Seattle’s economy is beating national trends and continues to grow. But at a time when Seattle is booming, it seems the city’s prosperity is not reaching all of its residents, and some are clearly being left behind. Those not on the upper rungs of the economic ladder are falling further behind and must increasingly supplement their kitchens with help from the city’s food banks. Seattle food banks are not able to keep up with this intensifying demand. The average amount of food each household is actually able to receive per visit is decreasing. Between 2012 and 2013 food banks had to stretch to provide food for over 47,000 additional visits. If the increasing demand seen in the first half of 2014 continues, food banks will need to provide for an additional 90,000 visits. This is on top of the already inflated 2013 service levels. Seattle’s food banks are working diligently to keep up with the growing lines, but our data shows that despite our best efforts, we are not keeping pace. The average amount of food given to each household during a visit has decreased by 20% since 2009. 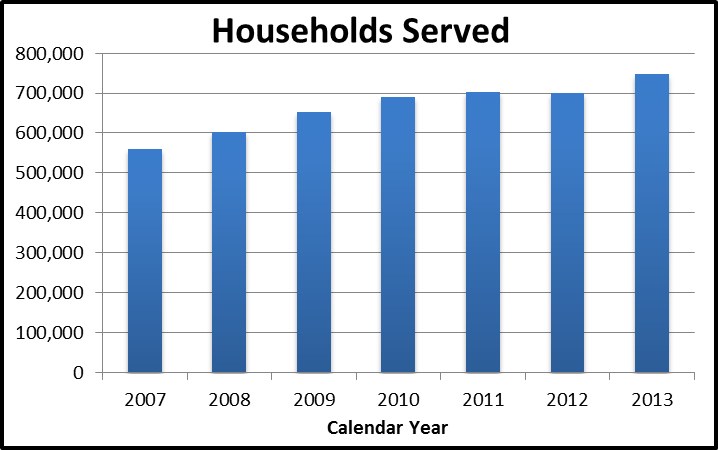 The average pounds per household distributed at each service decreased between 2009 and the first half 2014, from 31.3lbs to 24.9lbs. November and December will likely be even more challenging this year. As many as one-third of SNAP participants will see a reduction in SNAP benefits of up to $90 per month as rules from the new Farm Bill are implemented. Luckily, for Washington State residents, this will only be a temporary reduction, but it will make this holiday season more challenging for many of the families we serve and will undoubtedly increase the lines at food banks even further. Can look at my blog to see prices, and nutritional facts of healthy food at different grocery stores.